After Senate Republicans’ failure to repeal Obamacare, Mr. Alexander has set out on what he sees as a rescue mission to stabilize the insurance program by guaranteeing the consumer subsidies to insurance companies that President Trump has threatened to cut off, while granting states more flexibility to offer different insurance options. He and Senator Patty Murray of Washington, the top Democrat on the panel who has been a productive negotiating partner with Mr. Alexander in the past, have agreed to convene hearings when the Senate returns in September and to try to push some minimalist legislation through Congress by the end of the month. Even a small bill would be a feat in a Congress that has delivered so few results. But Mr. Alexander, a durable believer in the legislative process, sees it as a possibility, with the alternative being a failure that is certain to rock already reeling individual insurance markets. “It has to be simple if we are to get bipartisan agreement by mid-September on an issue that has divided the parties so much,” he said. Stabilizing the markets for a year, he said, would provide breathing room to “tackle bigger issues” on health care. Mr. Alexander’s political and policy challenges are formidable. First, he would have to get a consensus on his own committee, which ranges from Senator Rand Paul, Republican of Kentucky, on the right, to Senator Bernie Sanders, independent of Vermont, on the left, with a bit of everything else in between. Then he would have to get it through the full Senate, where nothing to do with health care has been able to attract a majority. Then the measure would go to the House, where resistance is even stronger to anything that resembles an effort to prop up the health care law. Finally, there is the White House, where President Trump has suggested he might unilaterally terminate the funding Mr. Alexander wants to preserve and let the current health program collapse — an idea the senator thinks is a bad one. His opposition could put him in the line of fire from a president he barely knows. But Mr. Alexander is the rare senator who has strong relationships with Senator Mitch McConnell, the Kentucky Republican and majority leader, as well as Senator Chuck Schumer of New York, the Democratic leader. Those ties could prove useful. But he is already under attack from conservatives framing his effort as a bailout for insurers — a critique meant to resonate with voters still angry about the 2008 bank bailout. Mr. Alexander, who has run for president twice, served as education secretary and was a two-term governor and a university president before joining the Senate in 2003, realizes he is going to come under fire for doing anything seen as sustaining the health care law. He is undeterred. What would he tell an upset voter? “You are not going to think very much of me if I come up here and all I do is argue and never get a result,” he said. If he can be successful in this push, Mr. Alexander hopes it could provide needed momentum for the Senate, one that is admittedly finding it hard to produce because of intense partisanship. 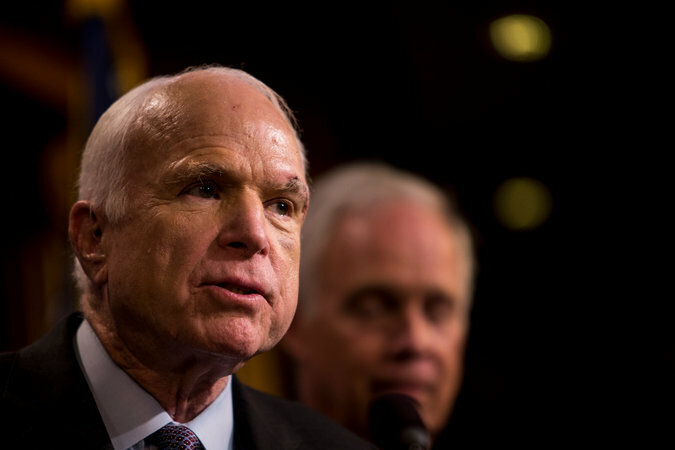 Senator John McCain, Republican of Arizona, last week called on the Senate to return to the more traditional approach of working together on national problems. After Senator John McCain, the Arizona Republican, last week called on the Senate to return to the more traditional approach of working together on national problems, Mr. McCain said he had “great faith” that Mr. Alexander and others could pull off a bipartisan feat. Mr. Alexander said he had embraced that praise as motivation. Back in 2011, Mr. Alexander took the unusual step of surrendering his party leadership post in pursuit of more freedom to work across the aisle rather than hew to the partisan line required of Senate leaders. Even absent the title, he is going to need a large following if he is to bridge the seemingly intractable division over health care. Click the “play” button above to start the show. Make sure to keep that window open on your browser if you’re doing other things, or else the audio will stop.